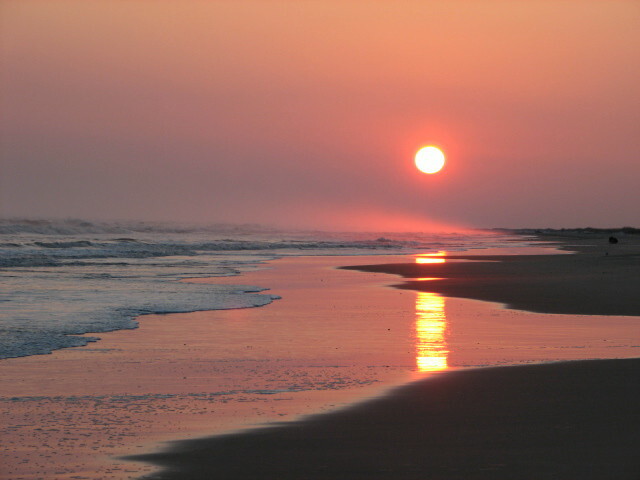 On Friday, June 8, Ocracoke pulled in international attention as its small section of lifeguarded beach was named number one beach in America for 2007. The official announcement was made that day on the beach at 12:15 pm and included comments from NPS Ranger Kenny Ballance, Hyde County Chamber of Commerce Director Margie Brooks, Hyde County Commissioner Gene Ballance, Executive Director of the Division of Tourism, Film, and Sports Development Lynn Minges, Congressman Walter Jones’ District Director Millie Lilley, and of course, Dr. Beach. Dr. Stephen Leatherman, aka “Dr. Beach”, is a North Carolina native who now is the chair professor and director for Florida – based National Heathy Beaches Campaign through Florida International University. He has been naming the top ten and twenty beaches of America since 1991 and Ocracoke has placed on that list every year since 1996. In 2007, for the first time ever, Hawaii or Florida did not place #1, and Ocracoke took the spotlight. Leatherman only considers swimming beaches on this list, which often cut out Maine, Oregon, and California. “If I was looking at surfing beaches or other criteria, it would be a totally different list,” said Leatherman. Criteria include beach driving, amenities, views, rip currents, wave size, and air and water temperature. He stressed the importance of beach safety and referenced his new book on rip currents, “Dr. Beach’s Survival Guide”. “I’m considering making lifeguards a hard requirement for the future. It needs to be a tougher standard for beaches to work towards having,” said Leatherman. “It is crucial for Ocracoke to have that small section of life guarded beach not only for safety but for education.” Now that Ocracoke has reached the top, it will be retired as a national winner and not be considered for future Dr. Beach lists. While Leatherman has received criticism of this, he will keep on retiring the national winner to give others a chance. So what does this new acclaim mean for the island? The 2002 national winner was St. Joseph’s Peninsula State Park of Florida. Katie Flanagan, information director for the Florida Division of Recreation and Parks, shared attendance and economic statistics for the winning year and two years after. The park saw the immediate expected boost from 2001 for July, +26%, and August, +44%, after the announcement. It still hasn’t dropped back to its averages pre-national acclaim. Attendance also continues to rise for Fort De Soto Park, national winner in 2005. “Dr. Beach definitely boosted business here the week after his announcement,” said Tommy Hutcherson, proprietor of the Variety Store. “Usually, during the 2nd week of June, not all kids are out of school and folks still have graduations to attend, so business is not normally at the hectic pace just yet. But this year the island was jumping with people, especially with day trippers coming from the northern beaches to check out ‘the number one beach in the country’. With all of the media exposure Ocracoke has received in the past couple of weeks, we can expect a very busy summer.” According to Hatteras ferry office statistics, traffic from Hatteras to Ocracoke the week after the announcement averaged 2419 vehicles on Tuesday, Wednesday, and Thursday, the most popular day-tripper days. In 2006, the average for this second week in June was only 1638 vehicles. Best Undiscovered Beaches. (Maybe not anymore.) Earlier this year, CNN rated it in the Top Ten for Shelling. And with all that attention and based on past Beach announcements, island residents fully expected to see Matt Lauer standing on the life guarded beach on Friday morning to film the Today Show. Powerful rumors had circled the island several times about where he was staying, where he had been spotted, and what time everyone was gathering on the beach for the live filming. Ocracoke School sent home permission slips to all the parents of the students to announce a 2:30 filming on Thursday, June 7 at the school. That day, the students and newly graduated pre-K Class gathered on the front steps of the school where they met a lively Dr. Beach and the WITN-TV crew. In the past, the Today Show has cut to live feed of Leatherman at his #1 pick, but they have never filmed from that location. When asked about next year’s list, Leatherman replied that he would start tomorrow. It’s a fulltime job for this traveling scientist: he’s been to every beach in the U.S. twice and he revisits the top twenty every year. He gets reports from nationwide colleagues on other beaches if they’ve made big improvements and are potentials for the list. So, the good news: international publicity. The bad news: international publicity. The ugly: the misinformed. It’s a tough award to accept knowing that most businesses and services here operate at full potential without being full. And we’ll just have to take the phone calls and point them in the right direction.